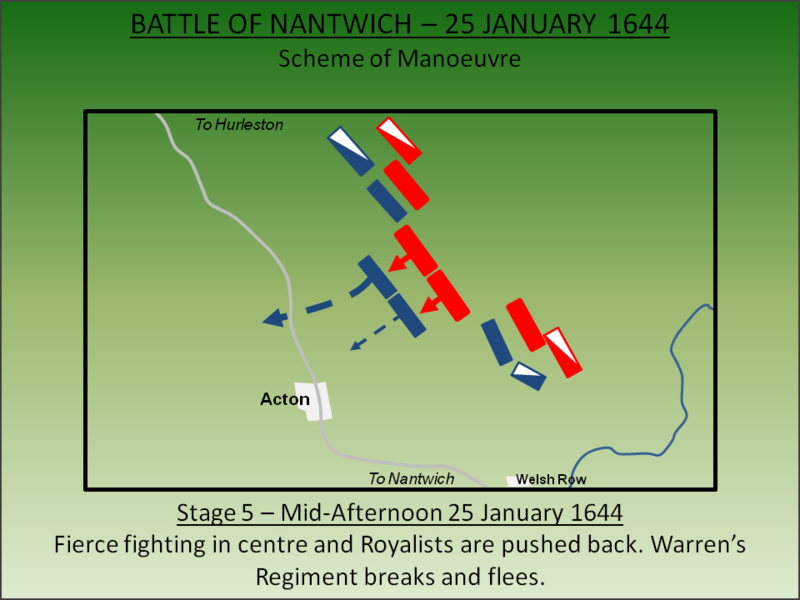 Fought in the enclosed fields and narrow lanes to the north west of the town, the Battle of Nantwich ended Royalist supremacy in Cheshire. Under Sir Thomas Fairfax, the Parliamentary forces not only relieved the besieged town but routed the army of Sir John Byron’s army taking in excess of 1,500 prisoners. Throughout the Civil War, Wales and the Border Marches were predominantly Royalist territory. Chester in particular was a stronghold for the King and was seen as critical for the war effort; the Royalists were hopeful of securing peace in Ireland and importing large numbers of troops through the port to fight the Parliamentarians. However throughout 1643, Parliamentary forces under William Brereton sought to gain control of Cheshire. 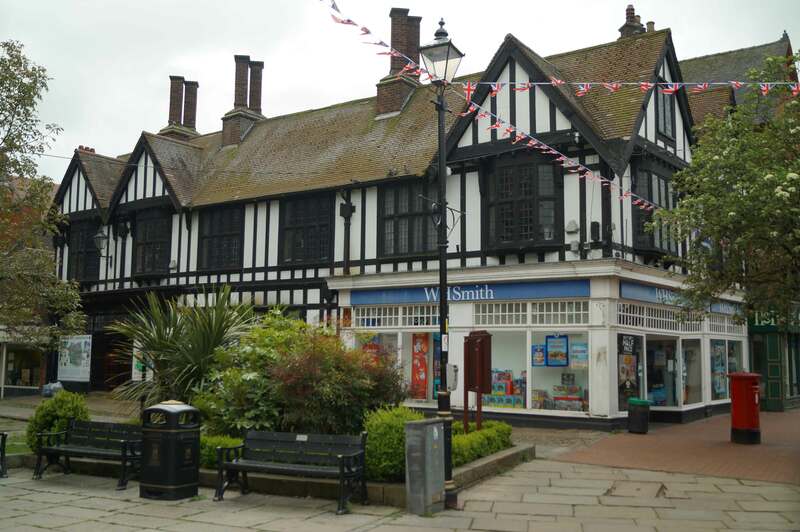 He achieved success at the First Battle of Middlewich (13 March 1643) and established his headquarters at Nantwich, a small town 17 miles south east of Chester. The Royalist Commander in Wales - Lord Arthur Capel - had attacked Nantwich in October 1643 but had been repulsed. Furthermore the defeat had allowed Parliamentary forces under Brereton and Major-General Sir Thomas Middleton to penetrate into North Wales. In light of the failures, the King appointed Sir John Byron as Field Marshall of Wales and the Marches at the end of 1643. Byron brought significant military resources with him which, when combined with Capel's existing army, gave him significant superiority in numbers over the opposing forces in Cheshire. 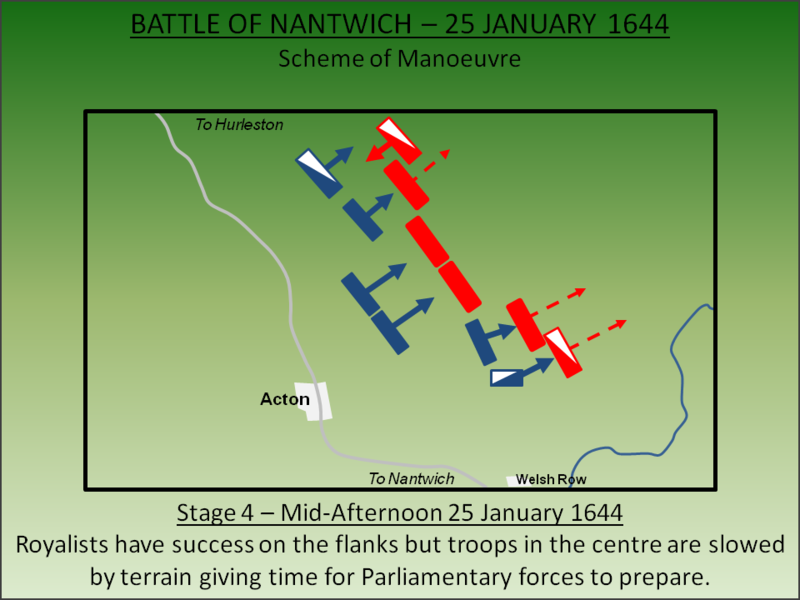 He overwhelmed and defeated Brereton at the Second Battle of Middlewich on 26 December 1643. 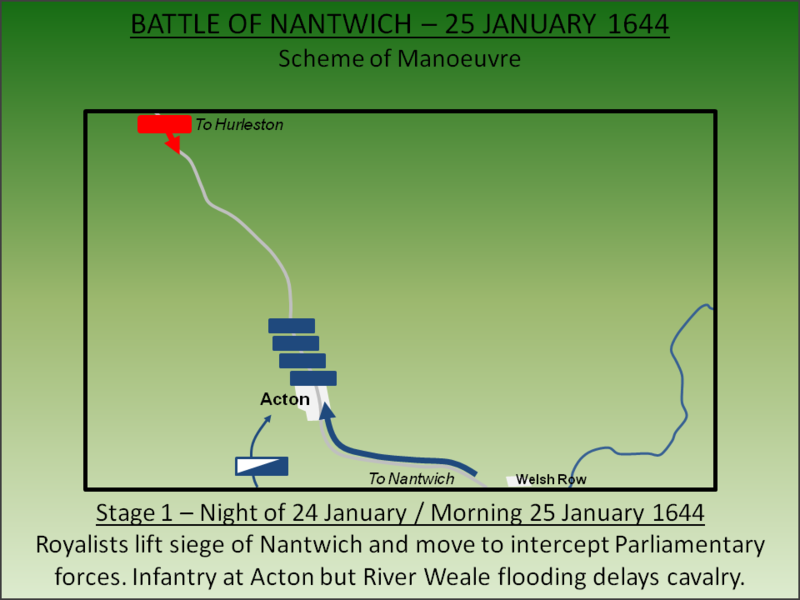 The shattered Parliamentary forces retreated to the safety of Nantwich whilst Brereton himself fled to Manchester. Prior to his defeat at Middlewich, Brereton must have confidently thought he was winning in Cheshire but now found his situation desperate. 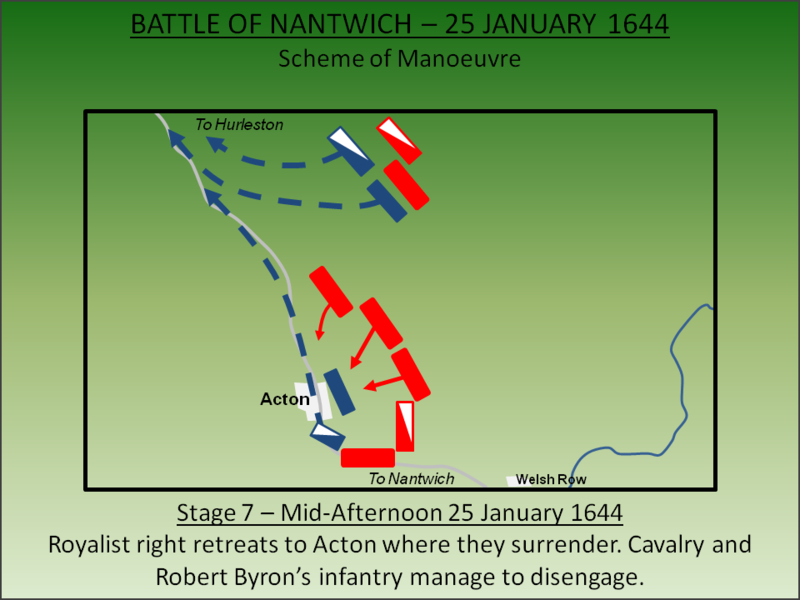 There were no Parliamentary reserves in the region and in early January 1644, Byron besieged Nantwich determined to dislodge the Parliamentary garrison and neutralise the remnants of his army. In London, Parliament viewed the potential loss of Nantwich as unacceptable - it was a key base to disrupt the flow of Royalist forces imported from Ireland - and therefore Sir Thomas Fairfax was ordered to march to Chester. He had successfully overrun Lincolnshire after his victory at the Battle of Winceby (1643) but his forces were not at their best; they had not been paid and supplies were scarce. 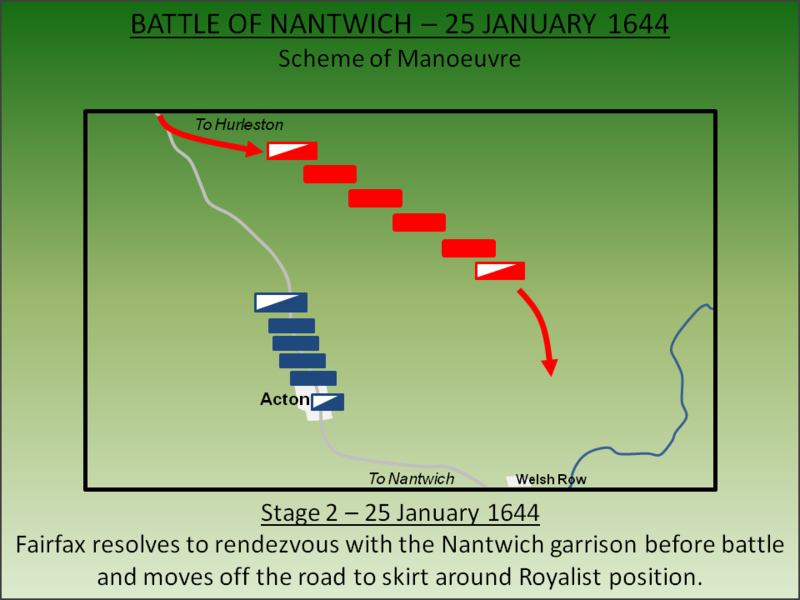 Attempts to delay his deployment were rejected and on 29 December 1643 he was on his way to relieve Nantwich. Byron launched a new assault on the town on 18 January 1644 but, like the earlier attempt by Capel, was repulsed with heavy casualties although he redeployed his forces to sustain the siege. Fairfax took a cautious route to Cheshire skirting around the Royalist strongholds in Nottinghamshire, Derbyshire and Staffordshire whilst concurrently mustering more forces. On 24 January he was at Tilstone, some 7 miles north of Nantwich. Byron was aware of Fairfax's approach and on the night of the 24 January, he lifted the siege and deployed his infantry north west to intercept. 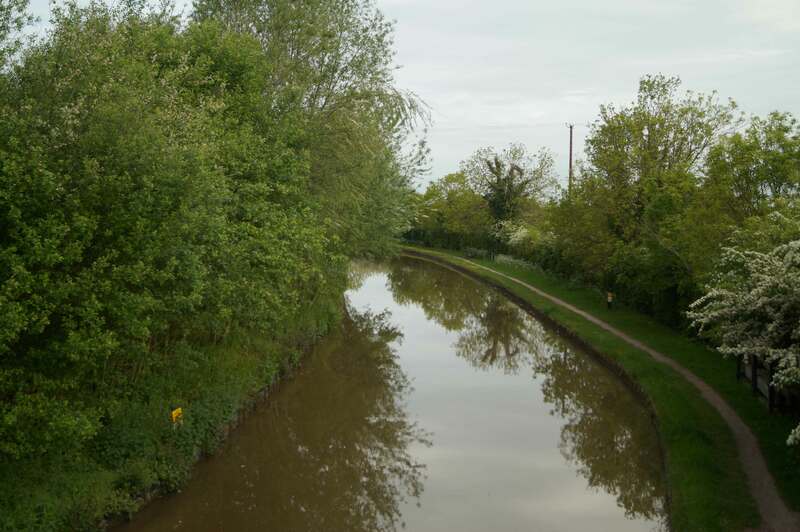 Byron's original intent is not fully known but it is presumed he intended to fight Fairfax at Barbridge, three miles north of Nantwich. Certainly on the morning of the 25 January a short skirmish was fought there with some of Byron's men. However, if this was his intent, his plan was foiled by the weather; a sudden thaw led to the River Weaver overflowing and destroying the Beam Bridge over which Byron needed to move his cavalry. His forces were now cut in two with the infantry at Acton, some 3 miles from the main Parliamentary force, and his cavalry on the south bank of the River Weaver had to take a 5 mile diversion cross country via Shrewbridge to link up with the foot. The battle itself was fought to the east of Acton in terrain that consisted of fields enclosed by hedgerows particularly unsuited to cavalry. 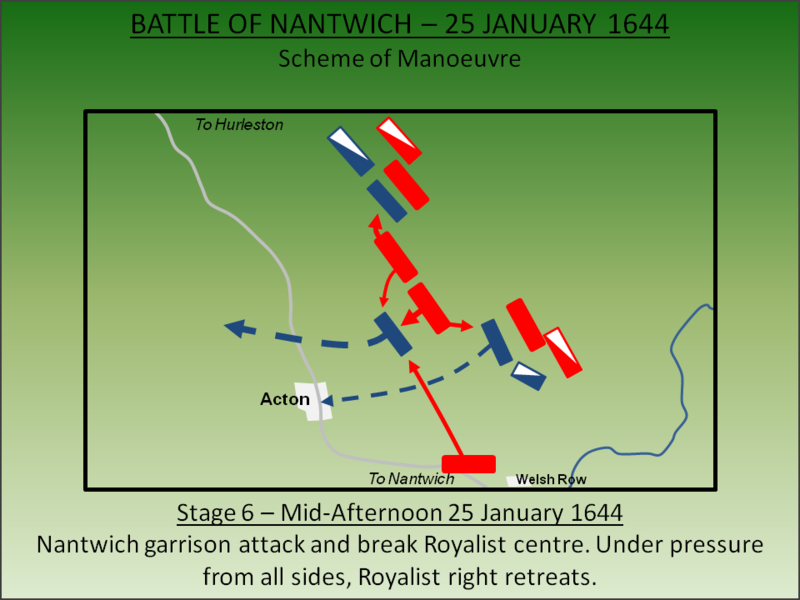 After the initial skirmish at Barbridge, fought earlier on the 25 January 1644, Fairfax continued his march south east towards Nantwich on a direct line towards the Royalist infantry at Acton now just 2 miles ahead of him. He held at Hurleston to hold a Council of War where he resolved to relieve Nantwich prior to fighting the battle as he hoped to bolster his forces from the garrison there. The delay brought Byron sufficient time to get his cavalry to Acton. Up until this point Fairfax had been advancing along the main road to Nantwich, today the line of the A51. He now swung his forces off the road and attempted to skirt around the Royalists to the north. 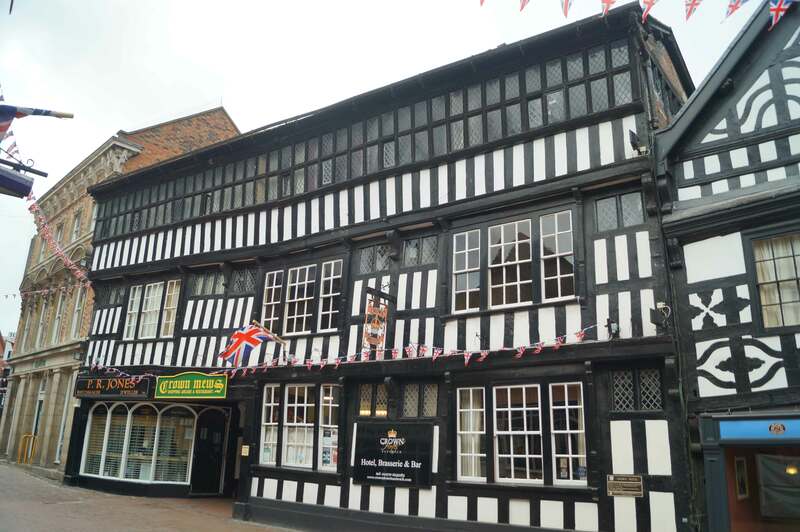 He aimed to head for Welsh Row, a small settlement to the north west of Nantwich and in full view of the town hoping to draw out the garrison to join him. Aware of Fairfax's movements, Byron deployed his forces to intercept. The advance was difficult as the terrain consisted of fields enclosed by thick hedgerows. The cavalry advance was completely frustrated and it was infantry on the flanks who made initial contact around 3.30pm engaging the Parliamentary Vanguard and Rearguard. The initial attacks of the Royalists were successful. On the left of the Royalist line, Robert Byron pushed back the Parliamentary Rearguard under Colonels John Booth and Holland. Their advance was only checked by the cavalry of Sir William Fairfax. On the Royalist right Major-General Gibson pushed back the Parliamentary Vanguard, under William Brereton. Despite the Royalist success on the flanks, in the centre they were less fortunate. The enclosed fields had delayed the advance of the main body of Royalists under Colonels Earle and Warren. By the time they arrived at the Parliamentary line, Fairfax was ready for them. Fierce fighting followed and the Royalists were pushed back with Warren's Regiment breaking. 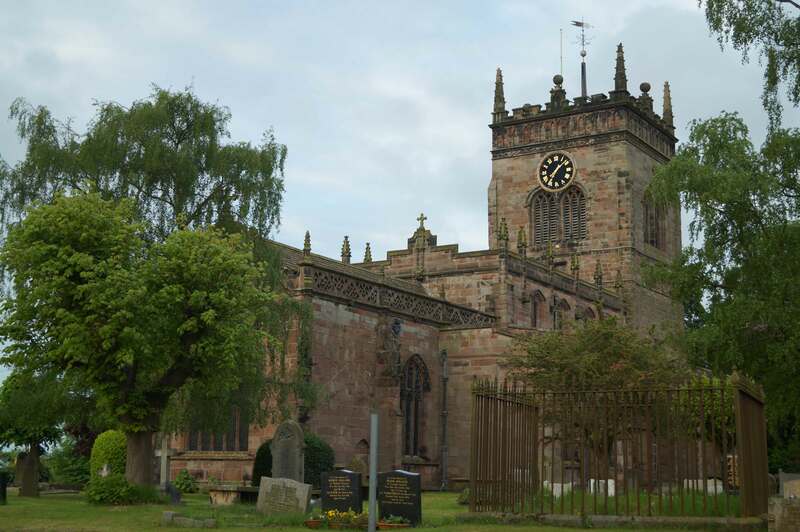 Gibson’s forces, now under intensive attack, retreated back towards Acton where they made their stand at St Mary's Church. Over 1,500 men would surrender to the Parliamentarians including every Colonel in Byron's army save his brother. Both Sir John Byron and Robert Byron managed to disengage their respective forces and retreated towards Chester. The battle was a resounding victory for Parliament. 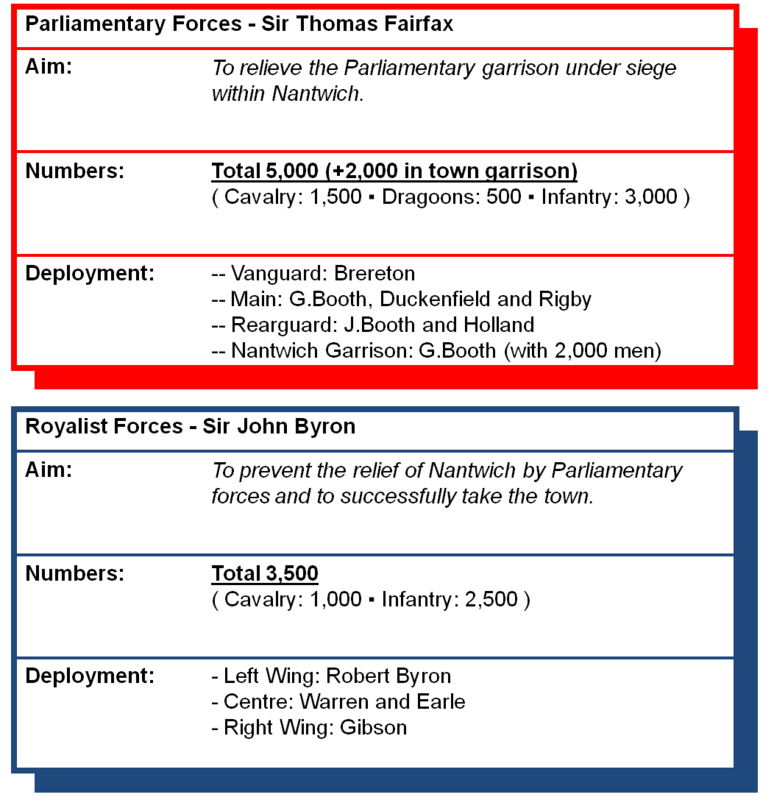 Nantwich would remain in Parliament’s hands whilst Byron had been largely neutralised including any threat to garrisons in Lancashire. Brereton was now able to continue his campaign in Cheshire. Lancaster, J.H.D (2015). 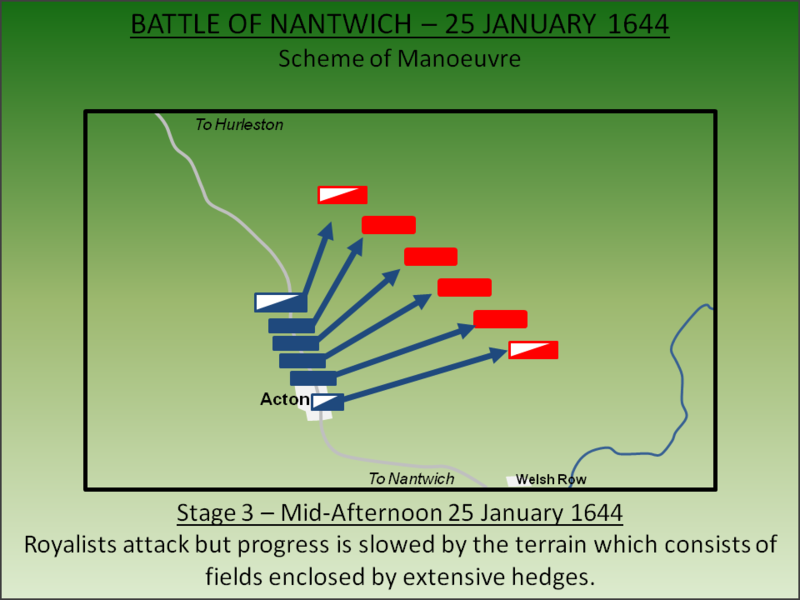 Nantwich: Battlefield visit notes and observations. CastlesFortsBattles.co.uk. Ordnance Survey (2015). Nantwich. 1:1250. Southampton. The battlefield from near the Acton footbridge over the Shropshire Union Canal (Royalist position in the foreground). The battlefield from near the Acton A51 crossing over the Shropshire Union Canal (Parliamentarian right wing in the foreground). St Mary’s Church. As the forces of Major-General Gibson broke, they fled back to Acton and ultimately to here at St Mary’s church. The structure still bears the scars of the fighting. The defenders ultimately surrendered to the Parliamentarian forces. Shropshire Union Canal. The canal has been cut directly through the centre of the battlefield. On the positive side this ensures public access and near Acton footbridge there is a good view of the battlefield. Nantwich. Although the fighting took place outside the town, many period buildings can be seen within making it well worth a visit. The battle was centred on Acton which is found on the A534. 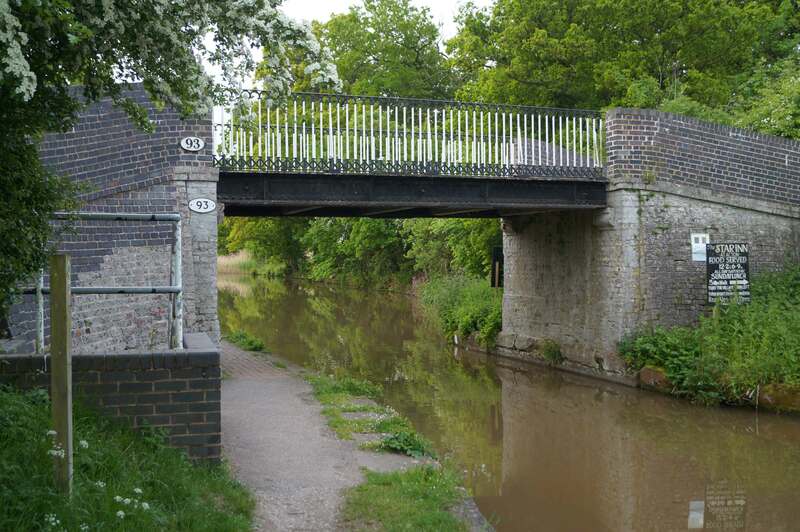 There is a car park in the vicinity of St Mary’s church and the footbridge over the Shropshire Union Canal, with views over the battlefield, is within walking distance.